Above Photograph: Tinker, about four weeks, playing in the snow. Ernie and Bert have done a bit of agility but I have very few pictures. 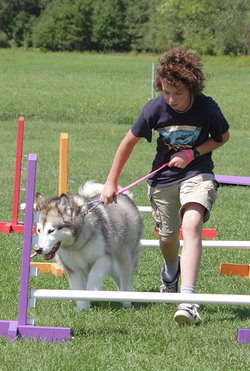 Alaskan Malamutes are actually very good at agility. Ernie is on the right and below is Tala, both as young dogs. 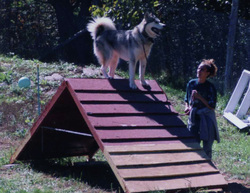 Tala did agility classes her entire life but this was the first, for her or I, at the sport, almost 10 years ago .... Bert and Ernie have only done agility a few times. 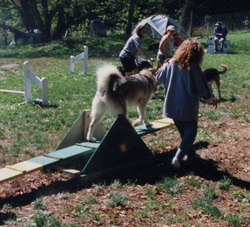 As far as I am concerned, Alaskan Malamutes are very, very good at agility. 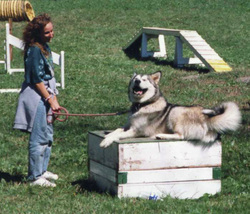 Tala and I in the early years just starting out in agility. Here she is refusing to move off the agility box. 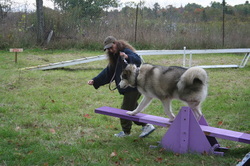 Tala and going over a piece of agility equipment. Ah yes, Tala deciding once again, to not get off the equipment. Ernie enjoyed the people at this agility clinic far more than anything else! Ernie didn't really enjoy jumping over things but did it anyway.